Wide Angle Lenses for today's criterion falls into below 20mm, and it is true that even a 15mm lense can not declare itself as a Super-wide angle since there are many 14mms and even a 12mm from Cosina. Despite of above facts, for R-Leica System the 15mm is the shortest focal length available and we contend that up to 28mm lenses shall be called wide-angle and 35mm shall be categorized as a standard lense when the applications distinguished purposefully. Hence we took off 35mms from the group picture. You might notice that the Fisheye is also dropped from the picture and we apologize that at the time of taking group picture, the 16mm was just not there. The picture at the bottom of this column shows it. 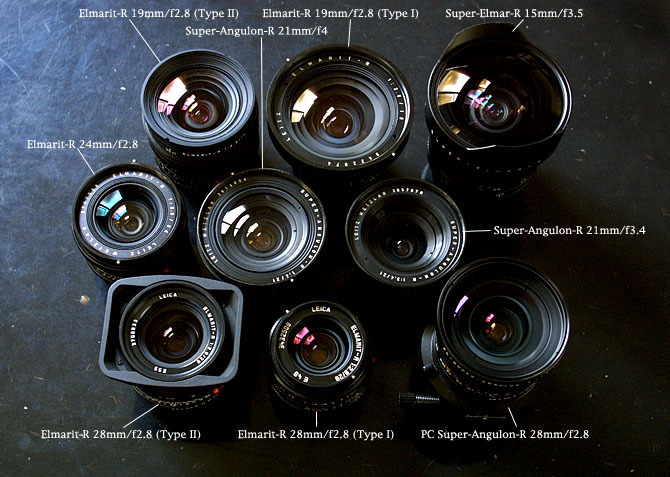 Super-Elmar-R 15mm/f3.5 became available since 1980 to carry out the 'extreme' wide angle. Its application has been thought to be within a confined spaces such as driver's seat of F1, however the photographer of these days utilizes its perspective even at the portrait. Fisheye-Elmarit-R 16mm/f2.8 was designed by Minolta in 1974 and still made by Minolta. With its special perspective, one can create a whole new photographic world. However, it was highly recommennded that the prudent control over the entire process of picture taking should be managed. Otherwise one starts to feed up its strong character. 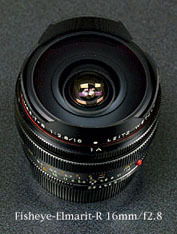 Elmarit-R 19mm/f2.8 (Type I) was introduced in 1975 as a supposed successor of Super-Angulon-R 21mm/f4. But many Schneider enthusiasts, particulary those who had fell in love with M's namesake, still persisted in Super-Angulon's superiority in distortion and the fall-off of the corner despite of its one-stop advantage as well as 2mm shoter focal length. Elmarit-R 19mm/f2.8 (Type II) appeared in 1990 as Leica's answer to the photographer who was still keeping off the Type I. The sharpness of the centre is outstanding but still a slight fall-off at the corner. Very high contrast and superb flatness of field. There has been a report from RLFC member that the earlier lens had a problem of eduction. Super-Angulon-R 21mm/f3.4 the first wide angle lens for Leicaflex introduced in 1964. The construction is similar to its M namesake. Protruding rear element charactarizes this lens and NO R body would accommodate it except Leicaflex Mark I and Mark II. Super-Angulon-R 21mm/f4 reasonable development of its predecessor in 1968. It has a long-life and still attracts people those who believes in Schneider's myth. There had been no change during its long production period except mono-coating replaced by multi-coating. Elmarit-R 24mm/f2.8 original design was believed to be done by Minolta. Its sherbet(sorbet) like fascinating tone reproduction is superb and the lens performs well in every measurement since its first introduction in 1974. PC Super-Angulon-R 28mm/f2.8 special lense for the specialist who requires shift performance in his or hers composition. It has a dove-tailed slide assembly and its sharpness and flatness of field are great to cover its large image circle. Since 1988. Elmarit-R 28mm/f2.8 (Type I) the smallest and the lightest lens within R-Leica Lenses. Its high-contrast characteristic brings a dramatic image even to the ordinary application which results this lens works more effective with negative film compared with positive film. Elmarit-R 28mm/f2.8 (Type II) improved performance in closer range and it gives clearer and sharper image, in other words, this lens performs better than its predecessor, however, we might emphasize the characteristic is somewhat changed from Type I.